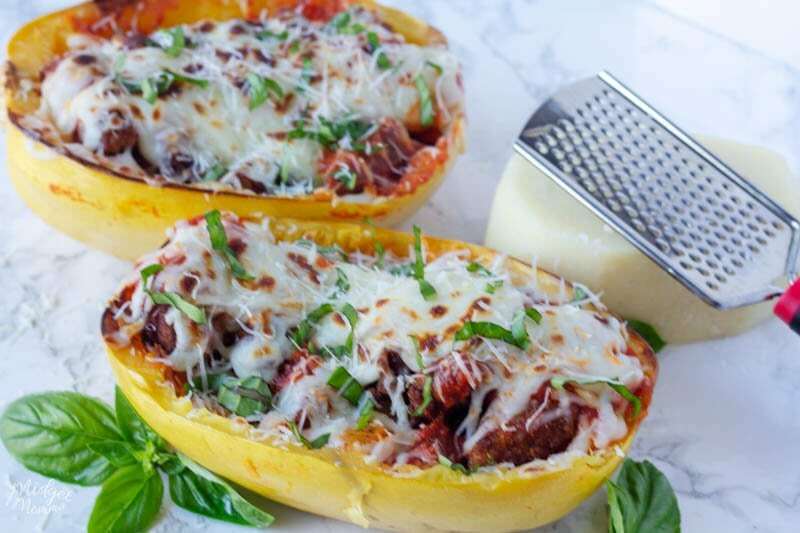 Chicken Parmesan Spaghetti Squash is an amazing tasting, healthier version of traditional Chicken Parmesan! 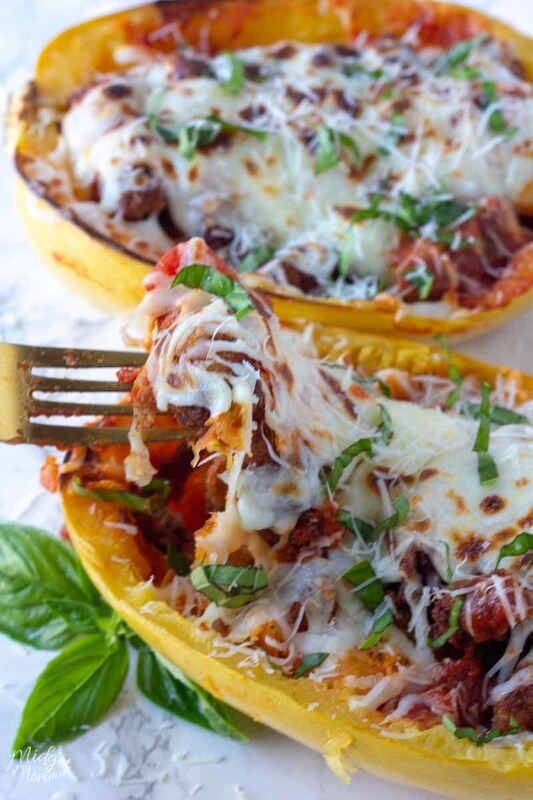 If you love baked chicken parm then you are going to love spaghetti squash chicken parm! This easy Chicken Parmesan recipe is baked in the oven and is so simple to make! Plus it has amazing flavor! I promise you will not miss your pasta! Tom’s favorite meal is chicken parm, when I told him I was going to be making spaghetti squash hicken parm I got the weird side eye, and then and eye roll and then “I guess”. I told him that this easy chicken parmesan recipe would be even better then the best chicken parmesan recipe I have made so far! He didn’t believe me, but I am happy to say that I proved him wrong! He took one bite of this amazing chicken parmesan recipe and told me, ” add it to the list”. That list is our meal planning list where we pick our meals from each week. When making this Chicken Parm Spaghetti Squash, you can use homemade marinara sauce or a jar of sauce. I like to make large batches of marinara sauce and keep it in the freezer for when I am going to be making something like this baked chicken parmesan recipe so I don’t have to use a jar of sauce because I much prefer homemade sauce. When making any type of chicken parm it is always better when you use fresh mozzarella cheese. 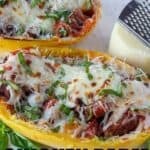 So before getting started making your spaghetti squash chicken parm shred some fresh mozzarella instead of using a bag of shredded mozzarella if you have the time to. 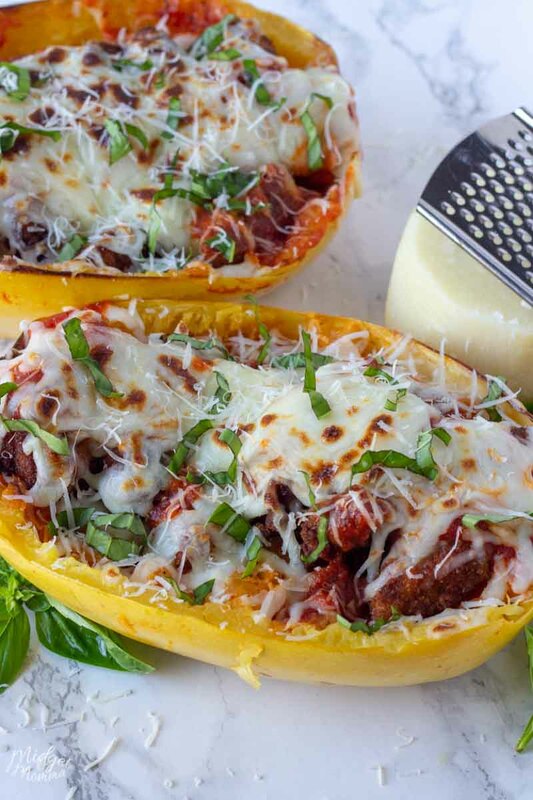 Chicken Parmesan Spaghetti Squash is an amazing tasting, healthier version of traditional Chicken Parmesan! Drizzle the cut side of the squash with the oil, salt, and pepper. Place them cut side down on an alumni foil lined sheet pan. Bake for 30 minutes, or until tender. While the squash is cooking you can start the chicken. Place the eggs, flour, and breadcrumbs in their own bowl to create your breading station. Whisk the eggs together until they are well combined. Dip the chicken into the flour then the egg then the breadcrumbs. Heat your oil in a large skillet over medium heat. Place the chicken in the pan and cook until golden brown on each side. Place the chicken on a paper towel-lined plate. Remove the squash from the oven and gently break up the flesh into noodles. Stir 1/2 cup of sauce into each half of the squash. Place the chicken on the top of the squash and spoon on 2 tablespoons of sauce over the chicken. 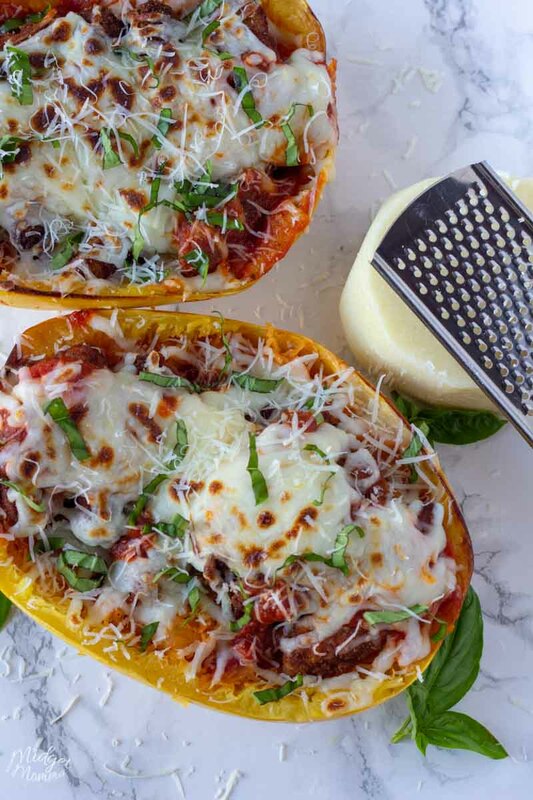 Top the squash with the mozzarella cheese. Place them under the broiler until they get golden brown. You can use coconut or almond flour or totally skip breading the chicken at all. It works just as well with unbreaded chicken. Also use a lower carb count pasta sauce like Rao's. 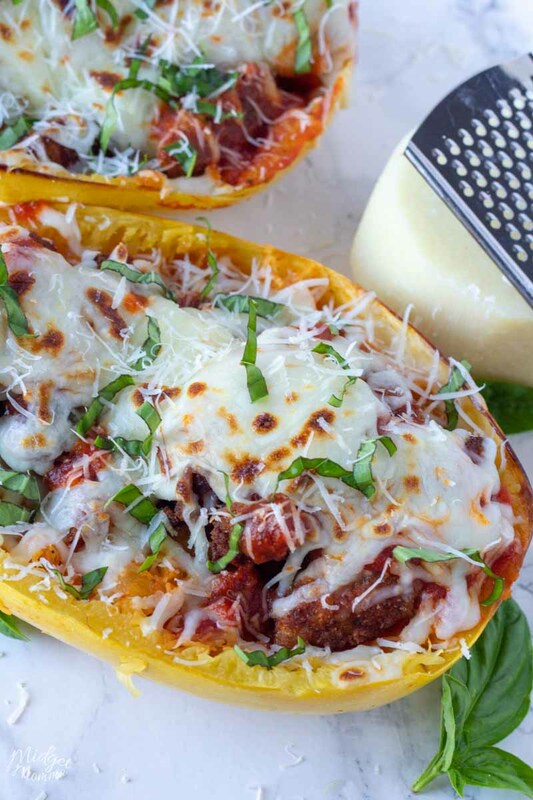 If you use a low carb sauce like Rao's, and skip the breading on the chicken, your carbs per serving will be 9-10g depending on the size of your spaghetti squash. 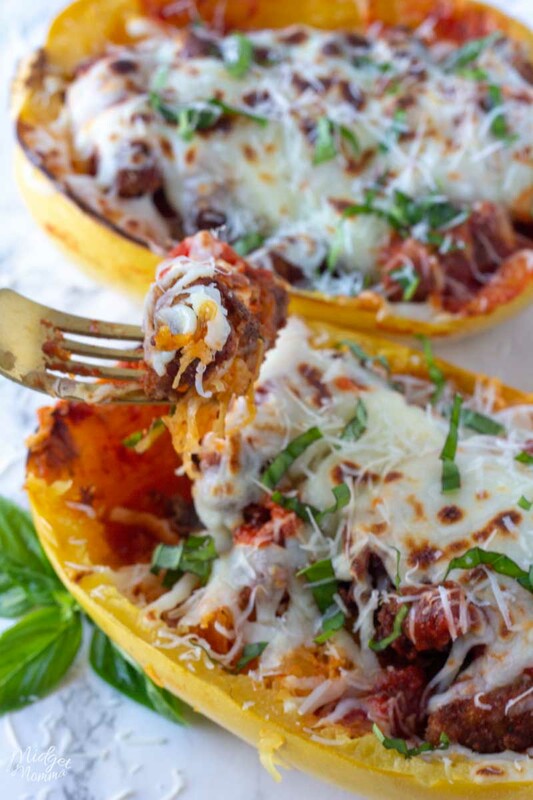 Looking for more Spaghetti Squash Recipes? Check these out! 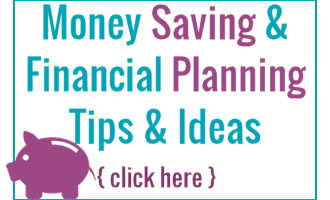 More Amazing Recipes to try!